"The volume is successful in its goal of providing a balanced presentation of an important theory….Many researchers in social cognition and attitudes will find it interesting and insightful." Contents: Preface. W.J. 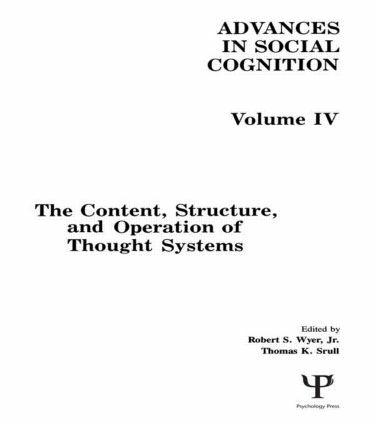 McGuire, C.V. McGuire, The Content, Structure, and Operation of Thought Systems. I. Ajzen, Attitudes and Thought Systems. D.E. Carlston, Free Association and the Representation of Complex Cognitive Structures. D.E. Dulany, Conscious Representation and Thought Systems. A.H. Eagly, The Three Ironies of the McGuires' Theory of Thought Systems. K. Fiedler, Beyond Local Cognitive Processes: Imprinting a Systems Approach to Social Cognition. R. Hastie, Comment on McGuire and McGuire's "Thought Systems." R.E. Petty, D.T. Wegener, Thought Systems, Argument Quality, and Persuasion. K.A. Rasinski, By Their Fruits Shall You Know Them? The Measurement of Public Opinion and the Content, Structure, and Operation of Thought Systems. S.J. Sherman, Thought Systems for the Past as Well as for the Future. P.E. Tetlock, Some Thoughts About Thought Systems. R.S. Wyer, Jr., The Construction and Use of Thought Systems: Some Theoretical Ambiguities. W.J. McGuire, Homage to Our Critics: A Dialectical Collaboration.